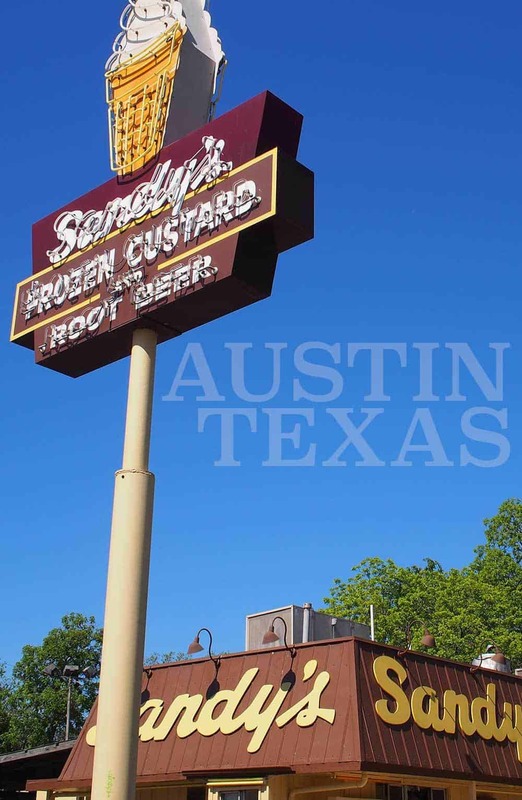 Since the 1940s, Sandy’s Hamburgers has been serving burgers, fries and ice cream at this location for generations on Barton Springs Road in Austin Texas. Truth 1: We chose our hotel in Austin because it was across the street from Sandy’s Hamburgers. That’s burger dedication for you! Barton Springs Road is a short walk away from South Congress Street aka SoCo area of Austin and from what I could tell, entirely different. SoCo being the hipster zone is where Airstream food trucks, cool restaurants and bars, gourmet coffee shops, yoga studios, and chic boutiques are the norm, and yet, the corner that Sandy’s Hamburgers is on is where time has stood still. The original sign and building from the 1940’s stands unchanged as construction workers stop by to grab a burger for lunch and the late night crowds come here to eat after the clubs have closed. A traditional drive-thru restaurant that you would expect from that era, Sandy’s Hamburgers lives on in Austin Texas unchanged by the hands of time. It is exactly what you would expect in an old fashioned restaurant from the United States America and I’m surprised that the Instagrammers haven’t found this place yet. Truth 2: There is a Whataburger, the Texas fast food burger chain, next door — another reason for the location of our hotel. Check out Sandys menu below. It has that old style snack bar feel don’t you think? We placed our order at the window and then waited for the friendly staff to call our order number for pickup. It was a little early for lunch so we decided to get a combo ($5.89 for a hamburger, fries and drink) plus one extra burger ($3.89) so that we could just split the fries and the drink. If it had been a little later in the day, or hotter outside I would have had a milkshake. Truth 3: I regret I didn’t try any of Sandy’s ice cream, milkshake, or the famous Sandy’s frozen custard or at least their homebrewed root beer. In the back of the restaurant is the parking lot as well as a covered area with picnic tables for you to sit in the shade and eat. The sweet leaf tea was too sweet for my taste (hence my earlier comment about the milkshake). They cook their “old-fashioned hamburgers” on a flat top versus other fast food joints where they charbroil their burgers. It’s not the best burger and fries I’ve ever eaten, but it wasn’t horrible. Sandy’s Burgers was a fun stop during our vacation and will prove to be a great memory as we look back on the time we ate at a traditional drive-thru burger joint. As we sat in the shade eating our meal, I imagined patio lights twinkling in the night sky overhead and a band playing in the corner of the parking lot. Then I quickly shook my head and snapped myself out of this silly daydream because that imagined scenario is too hipster cool and best left for SoCo. The real truth is that Sandy’s hamburgers has been in operation since the 1940’s for a good reason and I hope it stays the way it is! 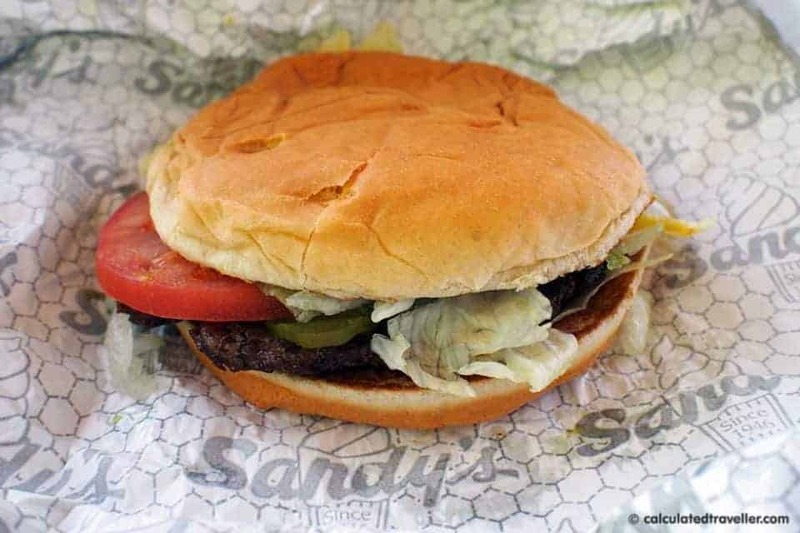 Read more reviews about Sandy’s Burgers on Trip Advisor. 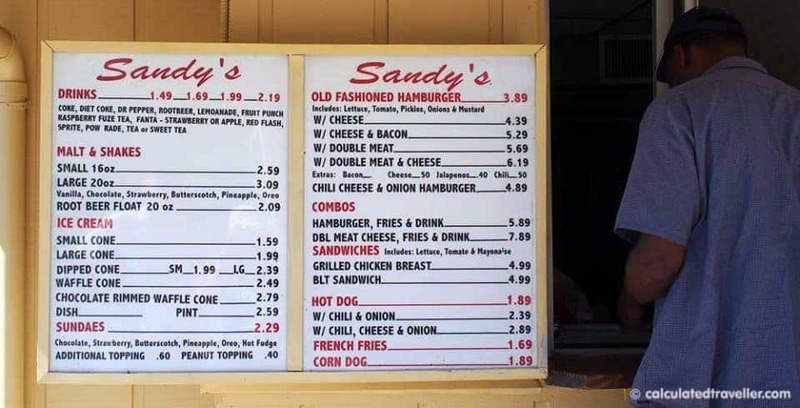 Have you eaten at Sandy’s Hamburgers Austin Texas? What did you think?